Brass Doorknocker measuring approx. 3.5 inches in diameter. 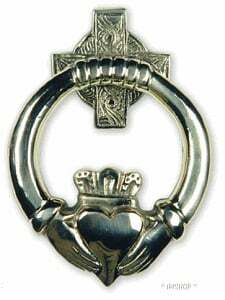 The Claddagh is made up of the Heart, which represents Love, The Crown for Loyalty and the hands symbolize Friendship. This doorknocker provides a warm welcome for your own door, or a great wedding or house-warming gift. Comes in a presentation box complete with attachments.